The November issue of your favorite magazines are out. Did you already get a copy? 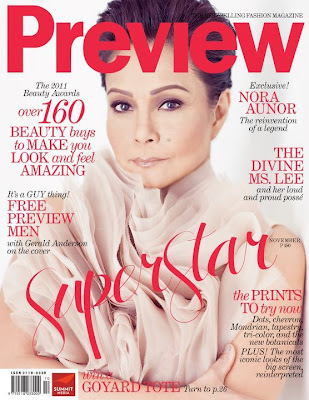 I believe, the most talked about issue of this month is Superstar Nora Aunor's Preview cover. She looks so clean and polish in the photo. What do you say? Carla Abellana cover Cosmopolitan wearing an animal printed top and leather skirt. 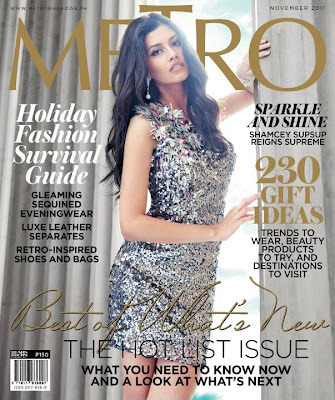 Shamcey Supsup, Miss Universe 2011 3rd Runner Up, in a glittery dress for Metro. The very fashionable Solenn Heussaff for MEGA. I love it! This is Kim Chiu for MEG. I didn't recognize her at first glance. I thought it was Iwa Moto in the cover. Hayy.. make up! Lastly, we have Erich Gonzales for Women's Health. Carla Abellana is so pretty. It looks so interesting!Love the covers! wow! That's true star quality shining on Preview's cover! btw, thank you so much for the award. I'm very touched to know that you've chosen me :) hugs!